Super Savings Item! Save 39% on the Ophion USB 3.0/2.0 IDE to SATA Dual-Bay Hard Drive Docking Station 2.5''/3.5'' All in one HDD SSD SATA,(Compatible with Windows 2000/ XP/Vista/ 7/8, Mac OS 9.1/10.8.4) by Ophion at Pacs BG. MPN: Ophion-HDD Docking Station. Hurry! Limited time offer. Offer valid only while supplies last. High speed USB2.0 data transfer rate up to 480Mb/s(Max),SATA II transfer speed up to 1.5Gb/3Gb/sec. 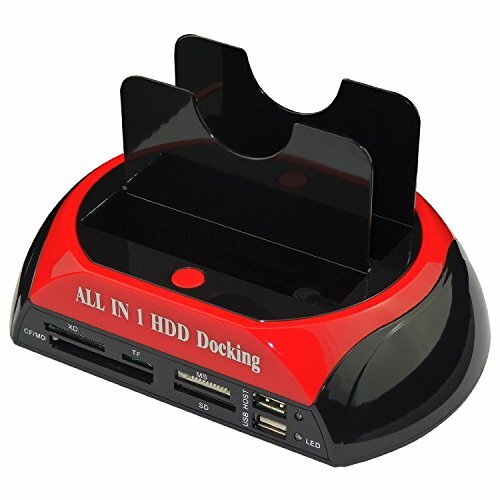 Integrates all-in-1 card reader(XD Card/TF Card/MS(Duo/Pro) Card/CF Card/SD Card). Use of highly durable ABS plastic materia;delicate and simple appearance,compatible with most of standard 2.5 "and 3.5" SATA IDE hard drives (SATA-I/II/), NOT compatible with Western Digital IDE hard drive. Stable and reliable DC power source: The power supply is highly efficient (12V,3A), so that a stable energy supply is guaranteed. One Key backup function (on USB port only), the best solution as users can easily backup files and data from PC to external hard disk. One Key backup function (on USB port only), the best solution as users can easily backup files and data from PC to external hard disk. Support plug and play, hot-swappable.Also support Tool-free Installation, No reboot and additional driver is needed, easy to install. and All Ophion Product backed by limited 1 year DCL Store (Digital component limited) Warranty Please contact us if you have any Question. If you have any questions about this product by Ophion, contact us by completing and submitting the form below. If you are looking for a specif part number, please include it with your message.